This article was originally published on January 25, 2000 by SignOn San Diego and Copley News Service. For all the hype about the "multimedia" nature of the Internet, the fact remains that most of us with our own Web pages up deal strictly with the visual. Adding sound or video takes skills few of us think we possess  and isn't the software horribly expensive? Well, as the power of computers continues to climb while prices keep dropping, neither of the above assumptions is holding up. 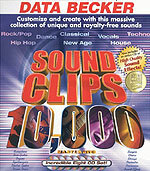 The new Sound Clips 10,000 from Data Becker is to audio files what the "Click Art" collections are to the visual  an inexpensive way to acquire a large, emininently useful collection of various elements you can use to create impressive effects. The eight-disc collection, which is all in .wav format, is broken down into different types of music (pop/rock, dance, hip-hop, classical/new age, vocals) plus sound effects. The music discs are organized by meter (how many beats per second), and then by instrument (bass, drums, etc.). Complaints? No jazz or blues; the jazz especially is a loss, as it lends itself well to intros and outros. Weaknesses? The four-track mixer isn't nearly enough to come up with the kind of full sound you might want for background or introductory musical passages. If you want to get into some serious sound editing, you'll want to get a decent loop mixer to go with your new sound clip collection. Sonic Foundry's Acid music production program is the best for beginners, and they have several stripped-down versions (DJ, Rock or Hip-Hop) that cost considerably less than their full-featured product while still offering more than enough power for the average user. Acid comes with a much smaller, and far less useful set of clips than the Data Becker collection, but it's ability to blend dozens of .wav files into a single sound clip is unmatched. And it's truly easy to use; within two hours, I'd created a one-minute song from the various snippets of bass, drums and guitars off the pop/rock disc. (You can hear it by clicking here.) The interface is drag and drop, and Acid automatically conforms the sound clip to the correct meter, so you can mix and match from the various directories in the Data Becker collection. The combination of the two programs is as sweet as an Everly Brothers harmony. Neither Acid nor the built-in loop editor in Sound Clips 10,000 offer you the ability to really edit the .wav files, but they do give you more than enough to get started and end up with results that are as good as the doofy theme song your local TV newscast plays. For most of us, just how useful is all this? Well, perhaps not too much. But it sure is a lot of fun, and you can get some cool sounds.